At the bow of the MV Skeena Queen, Elizabeth May is practically bouncing in her white running shoes. She waves excitedly at the dozen Green Party supporters on the dock of Salt Spring Island’s Fulford Harbour. The 100-car ship halts its approach mere metres from the terminal and reverses its engines: The starboard cable loop used to secure ferry to pier has fallen with a splash into the water. Both the botched landing and the low grey clouds threatening a downpour suggest an auspicious start to a day on the campaign trail, but the leader of the Greens is unfazed. “It’s just building the tension,” May says with a smile, as she zips up her lime-coloured rainjacket. It seems nothing can dampen her enthusiasm to be back among her constituents, campaigning for re-election as MP for Saanich–Gulf Islands—a riding made up of a peninsula just north of Victoria, five smaller islands connected by BC Ferries, plus a few islets accessible only by boat. Drivers honk and call out as they pass their MP. One woman sitting shotgun peeks out from behind a raised newspaper at the last second to offer a fleeting wave. “That’s Alicia Cormier—the NDP candidate,” says May. Both candidates are heading to the island’s annual Fall Fair to rustle up votes with exactly one month until the election. May hasn’t missed a fair in nine years. It makes sense: Salt Spring’s approximately 11,000 residents are spread out across 183 square kilometres—you go where the people gather. May has led the Green Party for the past nine years. In 2011, she defeated Saanich–Gulf Islands’ long-time Conservative incumbent Gary Lunn. This followed her unsuccessful campaign in 2008 to beat out another Conservative stalwart, Peter MacKay in Nova Scotia. Even though Greens recorded only 3.91 percent of the federal popular vote in 2011, down from 6.8 percent the previous election, May rallied Saanich–Gulf Islands to the second-highest voter turnout in the country—at 73.9 percent—and was elected the first Green MP in Canadian history. “I only spent fourteen days out of riding before the last election,” she says. “This time it’s been the reverse.” Her focus leading up to the October 19 vote: Have more than one Green elected to the House of Commons. The evening before the 2008 election, Gulf Islanders received automated phone messages, better known as robocalls, encouraging them to get out and vote for the NDP candidate—who had dropped out of the race a month prior. His name remained on the ballot and in the end received 6 percent of the vote; enough to secure Lunn a narrow re-election over a popular Liberal challenger. “People had their eyes open after what happened,” May says. 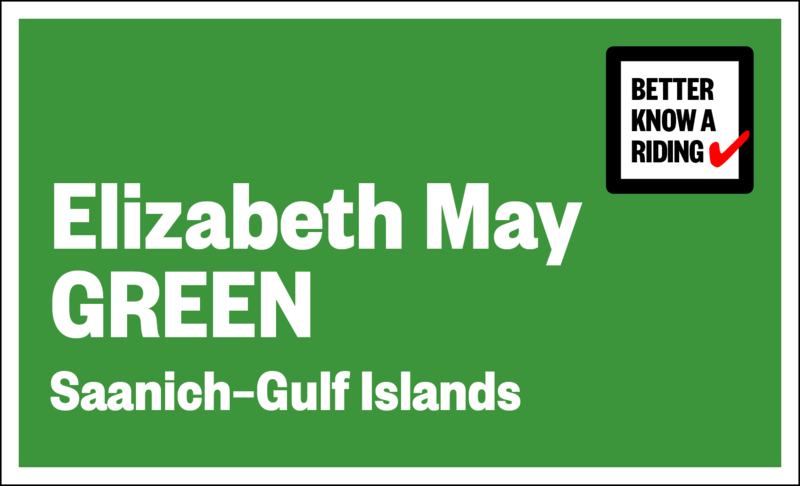 After determining Saanich–Gulf Islands had the best chance of going Green, May entered the race in 2011—finding constituents both frustrated with and wary of the Conservatives. While parts of Saanich remained deep Blue strongholds, blocks that went Liberal in 2008 overwhelmingly switched to Green, latching on to May like limpets. The Liberals ended 33 percentage points down from 2008, the Greens 36 points up. “I’m sorry, but our car is absolutely jammed,” May tells a woman near the ferry terminal who asks for a ride into town, “otherwise I’d take you.” May and her three-member logistics team pile into her white Prius for a meandering, thirty-minute drive past farm stands, wineries, and a fledgling olive orchard to Ganges, the largest town on the island. The road leading to the fair is lined on both sides with parked cars. Turns out we’ve just missed the 11 a.m. saw mill demo, but are just in time for the tail end of How to prune an apple tree—complete with a demonstration on a sapling. May makes it just through the gates before the swarming begins. It takes half an hour to progress twenty-five metres around the corner to the Green Party booth: the candidate stopping to engage with anyone, remembering faces and names like a Rolodex. A man hands her a gift of a shiny green pear with a handwritten note tied to its stem. “It’s one of my four prize-winning pears. The other three are inside,” he says, beaming. He motions to a large barn where entries for Longest Lasting Dahlia Bloom, Best Overall Entry in Gluten Free Baking, People’s Choice Award for Best Tasting Apple, and Best Pen of Market Lambs vie for prize ribbons. May finds a seat on the grass lawn in front of the stage just as Valdy (of “Rock and Roll Song” fame) approaches the microphone, fingers on his guitar. The crowd is a miscellany: long-time island residents in flowing hemp skirts next to lumberjacks in flannel and jeans; new, wealthier vacation-property owners next to families trying to find a niche amidst a widening socio-economic divide. “There’s more poverty on the islands than you might think,” says May. Federally, the environment and climate change is second after the economy in important issues for voters. But here on the Gulf Islands, perhaps not surprisingly, water management, pipelines to the coast, and the tanker expansion supported by Liberal premier Christy Clark are top of mind. “Most people here have a deep concern with protecting the coast,” she says. Nearly every resident lives within a half-hour walk of the ocean, where resident orcas are a common sight breaching offshore. May stops mid-sentence to sing along with Valdy: “And we’re all talking ’bout the water, the water…” She fades out, then takes a bite of a taco filled with deep-fried avocado and kale. In the fourteen all-candidates meetings May has attended in her riding, concerns about Bill C-51, ISIS, and the refugee crisis have been voiced as much as pipelines and tankers: “Voters in Saanich–Gulf Islands know more about the Canada–China investment treaty.” Who she’s comparing to hangs unsaid in the air, but it’s almost implied she means certain Members of Parliament. May’s still buzzing over the Globe debate. In a simultaneous event hosted by Twitter Canada in Victoria, she tweeted short video rebuttals to comments made by Stephen Harper, Thomas Mulcair, and Justin Trudeau. “Hitting thirty seconds was easy—that’s how long I have for responses in question period,” she says. Despite being a province away, by the end of the debate she topped the list as the most-talked-about party leader on Twitter. She seems equally incensed at the exclusion, and proud of the result. “What voters don’t realize is that the English-language Consortium debate may not happen,” she says. (Only May and Trudeau have confirmed to the event proposed for October 8). There’s concern in her voice: Voters often make up their mind based on the debates, she says, especially in an election where half of Canadians remain undecided. “If vote splitting was an issue, Harper would be fighting to have me in the debates,” she says. The crowd applauds as Valdy gives way to Chilliwack frontman Bill Henderson, who breaks into his song “Take Back This Land.” May stands up, starts clapping, and singing along to the chorus: “We’re gonna take back this country / we’re gonna take back this land / we’re gonna bring back our democracy and build Canada again.” For other high-profile politicians, the on-the-nose idealism could be a cringe-worthy moment. But, like the rest of the crowd, May means what she sings. While the fair may be more about shoring up her base than turning votes Green, May is clearly having fun. No issue seems too minor or too major. Throughout the day, she flips between the need of a mobile abattoir on Salt Spring to Harper’s muzzling of scientists; between the slated demolition of a house built on First Nations burial ground to how she was the first leader to condemn Bill C-51. With only a few hours before she has to be back at the ferry terminal, May insists on a spurt of door knocking. After a ten-minute drive outside Ganges, her team parks along one of the few streets on the Gulf Islands where door-to-door canvassing actually makes sense—it has ten-metre driveways rather than ones that stretch half a kilometre into the forest. Maliview Drive is also where the island’s elementary students flock on Halloween: perfect for blitz canvassing, perfect for blitz trick-or-treating. Eight volunteers fan out in pairs as the team’s canvassing coordinator quietly directs May whenever there’s an open door and a willing set of ears. “I remember this house,” May says, walking spritely up to the door of a bungalow shadowed by fir trees. “An elderly man used to live here and he wasn’t doing too well,” she says. She last saw him four years ago. Now a younger man opens the door, instantly reticent with May and the two volunteers standing on his porch. He says the elderly man moved off the island, but is doing well. For the first time all day, May’s unflinching positivity fades to concern. “I understand,” she says. “But what’s happened is that we’ve turned into an elected dictatorship. If you aren’t happy with the system, it’s so important to vote.” As the man closes the door, it doesn’t look like May has won him over—to voting Green or even voting at all. She jogs back down the drive and onto the street, smiles, and heads for the next door. She visits another dozen or so homes, ending the day looking across the Trincomali Channel that separates Salt Spring with Galiano Island—to another set of voters another ferry or water taxi ride away. There’s an urgency to May’s pace—on Twitter, while blitz door knocking, or at the fair—trying to reach as many people as possible before the sun sets on the campaign. For now, it’s time to head back to the ferry. She’s flying back to Ottawa in the morning.